June is in full swing. Graduation time is upon us, and so is the beginning of summer and summer sports camps. In fact, the Nike The Opening regionals just wrapped up in Eugene over the past weekend, and with the camp in the Ducks’ backyard, the event was an excellent opportunity for Oregon to make headway on the recruiting trail. To begin, let’s take a look at some athletes from the 2017 recruiting class who have interest in the Ducks. Saturday was a big day for Oregon, with three 2017 five-stars visiting the campus and meeting with the coaching staff a day prior to the Nike camp. Quarterback Tate Martell and teammate and wide receiver Tyjon Lindsey both won MVP honors for their respective positions on Sunday, and were joined by offensive lineman Foster Sarell on the campus visit on Saturday. All three players appeared to enjoy their time on campus, and hopefully the Ducks were able to make an impact on the talented group. Matt Prehm, of 24/7 Sports, had Martell quoted as saying, “It was awesome. I talked to Coach Helfrich and Coach Frost, and got to come out here and spin the ball a bit and see the facilities.” The entire coaching staff earned some cool-points with the group as well; “I really liked them. I wasn’t expecting anything bad, but I just had something different in my mind. I mean they are all so cool,” Lindsey said, according to Prehm. While these athletes are roughly two years away from college action, making good impressions on the top future talent could go a long way for Oregon on the 2017 recruiting trail. Both Martell and Lindsey extended their visit and were on campus Monday for a mini-camp style visit the Ducks hosted following the Nike camp. Transitioning to this year’s class, the Ducks had several 2016 prospects on campus for the Monday mini-camp as well. Camilo Eifler will join Martell and Lindsey for the Monday visit, and apparently Oregon pulled even with his leading school, the Washington Huskies. According to Justin Hopkins, of 24/7 Sports, Eifler had this to say after his Monday visit. 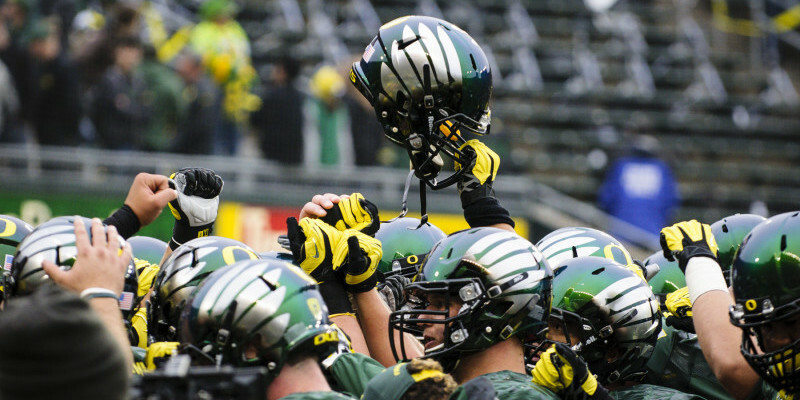 “It’s going to be a battle between Oregon and Washington. 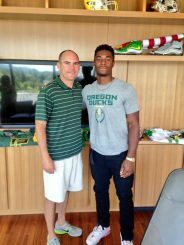 It’s going to come down to which school is going to prepare me and make me a better person.” While most are in awe of the Ducks’ facilities, Eifler also had this to say, “I learned a lot about all of the support they provide. And aside from all of the facilities and gear, that part really stood out to me. The academic support and how long the coaches have been there. 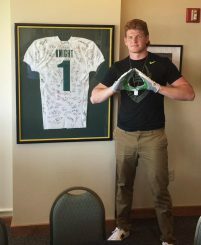 It’s pretty amazing.” It seems that the Ducks made a good impression on the four-star linebacker. Eifler isn’t the biggest guy on the field, standing only 6-foot-1 and weighing 215 pounds, but he has a knack for the ball and doesn’t shy away from contact. When you watch his tape, he plays bigger than his size and also has good ball skills when he drops back into coverage. He could be a key signing to help rebuild the Ducks’ linebacking corps for the future — and is added to the long list of targets at the position, which now stands at 21 total offers. It has been noted before that Oregon is in need of linebackers in this recruiting class. The current roster is filled with a majority of juniors and seniors, and 2015 signee Fotu Leiato will be the only freshman on the roster this upcoming season. Hopefully, the Nike The Opening camp and the visits that followed will add linebackers to the 2016 class. The Ducks might have added some help already though; in a recent verbal commit, Hunter Kampmoyer, from California. To be brief, the 6-foot-4, 240 pound Kampmoyer has potential to be either a rush defensive end or linebacker for Oregon. He is only a three-star player according to 24/7 Sports, but anyone who follows college football knows it’s not always about the star rankings when it comes to on-field production. Another player who was in Eugene on Monday was defensive end, Connor Murphy. Murphy is similar to Kampmoyer in his ability to play either linebacker, or defensive end in a 3-4 scheme. The Oregon coaches informed him that’s where they see him contributing, if he were to choose the green and yellow over USC, ASU, and Michigan. Murphy has the size, 6-foot-7 and 250 pounds, to step in and have an impact right away at the next level, and when you watch his film, you can see how he uses that size to disrupt both the run and the pass game. “All of the coaches were saying they would have me standing up at outside linebacker on first and second down. On third and fourth down they would put my hand in the dirt to get after the quarterback.” Justin Hopkins of 247sports wrote. Murphy went on to hint at what his priorities are when picking his future school, “First is academics. I believe in life after football. Secondly is the brotherhood, what is the community like. Lastly is that hunger, do they have that hunger for a national championship like I do.” To me, this is a great sign for the Ducks. Oregon has excellent academics, a great brotherhood and campus community, and honestly, it’s be hard to find another program that wants to win a national title more than the Ducks do. Oregon might be the perfect fit for Murphy. Overall, around a dozen athletes were in Eugene for the private mini-camp hosted by the Ducks following the Nike The Opening regionals. 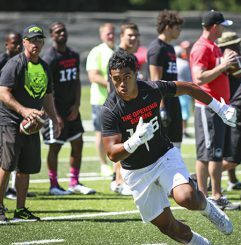 One of those players, Vavae Malepeia, a running back from Hawaii, committed to Oregon over the weekend. While running back certainly isn’t an area of need for the Ducks, maintaining the relationship with the state of Hawaii is extremely important, and there has been speculation that Malepeia could possibly switch to defense back at the college level. With the addition of Malepeia, the Oregon 2016 recruiting class now stands at nine verbal commits. When fans look back at this recruiting cycle, this past Monday will be a huge day for Oregon’s success. The ability to host a smaller camp for some of the top athletes in the region is a major benefit for the Ducks and will likely not only help Oregon gain exposure in 2016, but also in 2017 as well. So far, only one player committed to Oregon over the recent jam-packed weekend, but the impact of the relationships built from the recent festivities could be quite evident come signing day.